With the shrub shears of Okatsune the maintenance of your shrub will be a piece of cake. 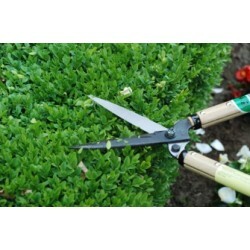 The shears have razor-sharp blades, and are in perfect balance for exact topiary (horticultural practice of training perennial plants by clipping the foliage and twigs of trees to develop and maintain clearly defined shapes). This tool takes the strain out of precision cutting, making it ideal for all jobs requiring meticulous attention to detail on hedges and shrubs, as well as for the precise trimming of lawn edges. The range consists of 3 shears: short, medium and large beak. Short model shrub shears with short wooden handles of 30 cm, and a large razor-sharp blade of 145 mm..
Short model shrub shears with short wooden handles of 30 cm, and a medium-long razor-sharp blade of ..